Ratchet & Clank is suitable only as a film for young kids to enjoy….. fans of the video-games might get away with some nostalgic elements, but not many. When it comes to providing a result appealing to a general family audience this clearly wasn’t a main focus for the film-makers. 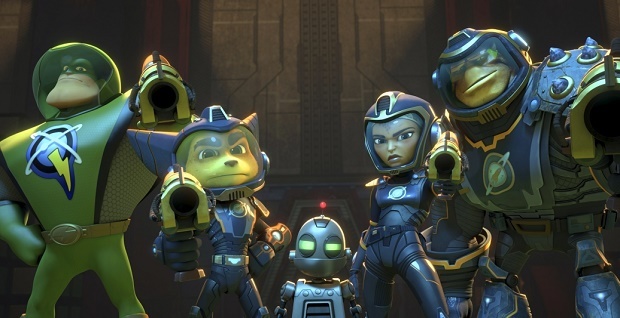 The film follows Ratchet and his sidekick Clank as they join forces with Captain Quark and the Galactic Rangers to put a stop to the Deplanetizer, a ‘Death Star’ like weapon capable of destroying entire planets. The film combines some elements from the original video games with a new story and new characters that were featured in the accompanying PS4 video game. It also comes with a very talented cast including Paul Giamatti (Drek), John Goodman (Grimroth), Bella Thorne (Cora), Rosario Dawson (Elaris), and Sylvester Stallone (Victor Von Ion). But apart from a few brief silver linings there isn’t much enjoyment to gain from this film for most people. The story of the film plays out very quickly, it is constantly jumping from location to location and moving along from one key plot point to the next at a very rapid pace. For the most part this is a somewhat good quality of the film, this means it doesn’t slow down drastically and just powers forward to the end. Really this hour and a half long film felt like it lasted for maybe 1 hour, especially good if you didn’t really care much for it. But this pacing was also a negative as at some points especially in the last third it felt like it was powering through a little too fast and skipping what felt like a lot of stuff. The story itself wasn’t rushed but i did get that feeling at some parts due to the quick editing and pacing.But hey, there’s that silver lining….. if you aren’t enjoying it, don’t worry, at least it will be over before you know it. The element i enjoyed the most in this film was the voice acting. Apart from the original Ratchet, Clank, and Quark voice actors being involved who are always going to be fantastic, it was the new celebrity voice cast i really enjoyed listening too. Paul Giamatti, Rosario Dawson, and Bella Thorne were the three key recognisable voices who were great in the film. I loved the way they voiced their characters and thought they were by far some of the better animated characters of 2016. Now the movie tanked at the Box Office so the chance of seeing a theatrically released sequel is as close to 0 as you can get, but if they did a DVD release i would be most looking forward to seeing some more of Cora and Elaris in the future. Sylvester Stallone is also in this movie but don’t get excited…. apart from various grunts here and there he maybe has like 2 lines that he probably recorded on his phone at 3am, he was just happy to cash in that paycheque. Humour-wise as i mentioned, the film doesn’t really provide anything for those over the age of 10. I mean, for me as a fan of the games, the familiar animation style and character personalities were enough to keep me enjoying the movie…… But that luxury wears off within the first 20 minutes, you realise that you’d much rather be spending your time doing something else (maybe even playing the game) and then you just sit and let everything fly by. There were maybe 2 or 3 specific moments where it got a little chuckle from me, and 1 or 2 personal moments where i saw parallels to Star Wars and other films but other than that there wasn’t anything else to actually enjoy. So in the end, this film probably came way too late when it comes to appealing to a young audience, as audience who were fans of the games aren’t young anymore. For young kids there are things they will enjoy in this film and it is short enough to appease their tiny attention spans. Fans of the video games can pick out and appreciate some things throughout but that is short lived. And for anyone else of an older demographic, if you have no relation or past with the games there really is nothing in here you could enjoy. There are much better animated films out there that offer more for a wider demographic so it’s probably better just to stick with that as this isn’t a good movie……. It’s not extremely terrible either, but it’s down there. Previous How Do You Do An Assassin’s Creed Sequel Right? Next MOST ANTICIPATED FILMS OF 2017 – It’s Going To Be A Big One!